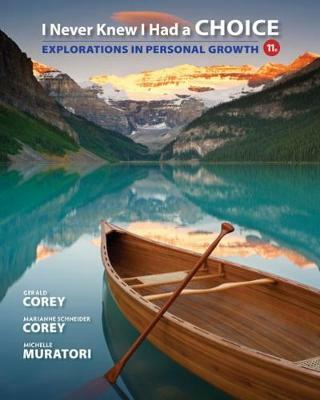 Honest and inspiring, I NEVER KNEW I HAD A CHOICE: EXPLORATIONS IN PERSONAL GROWTH, 11th Edition, will motivate you to focus on your personal growth and create real change. The text covers a broad range of key topics, including personal style of learning, the effects of childhood and adolescence experiences on current behavior and choices, meeting the challenges of adulthood and autonomy, and many other issues related to personal growth and development. The warm yet research-based discussion of significant dimensions of life will help you examine the choices you've made, expand your awareness of the choices available to you, and choose where to go from here. As you work through the text's self-inventories, exercises, and activities -- and read the first-person accounts of the difficult choices real people have made -- you'll gain invaluable insight into your life, beliefs, and attitudes in a personally empowering way.